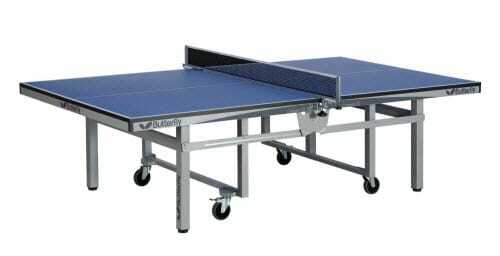 The Butterfly T2625SU Centrefold 25 Sky Rollaway Table Tennis Table is one of the truly superior quality table tennis table that being released by the company. This excellent table is built for heavy duty. The special design of fold and wheel away for space saver purposes make the table can be maneuver around easily. Furthermore, this table tennis table is actually made to take care of players using wheelchairs. The designated distance between the table end to the first leg (40cm) and bar(16 inches) is set in compliance with Paralympic requirement. – Tournament-level ping pong table with fold-and-roll features. – Scratch-resistance of table top as it is built of hard PVC band along with sturdy 2″ steel rim. – Features with 15″ (width) and 63″ (height) when folds up. – Easy rolling system with implementation of 5-inch ball bearing casters. – ITTF Approved – 1″ table top (25mm). It is a classic competition table that been used in many clubs around the United States and all over the world. The table is especially being used in many tournaments and their tables have been chosen as the official table of the U.S. Open and U.S. National Championships. The Butterfly Centrefold 25 Sky Rollaway table tennis table is constructed out of quality thick wood that is of 1″ width. This optimum thickness can provides players with perfect bounce, speed and spin whenever playing the game with it. This can ensure players to keep their optimum performance by playing their style with the table. This is utmost important for international players since consistency is a key factor for them to win the game. It is a very solid competition table that comes in complete assembled. Therefore, it is not required for any assembly work from you. It has a folding mechanism that allows you to fold up all sides at one time when you finish playing the game and want to fold it up for storage. Two persons are recommended when folding this table. It is advisable for you to always follow manufacturer instructions to avoid any miserable things happen. The net assembly is also very simple. Before you fold up the table, you will need to loosen up the net and post from the table. The net and post is independently attached to the table and you can remove it very easily. After that, you can pull on the handle of the table and lift it up. This may take a little bit of muscle for you to do this but you can observe the mechanism in the center is catches both table halves have the same folding mechanism so they will folded up together at the same time. The table is built with very good and solid casters. Steel welded to being at very solid table. Thus, there is very smooth for you to move the table anywhere without any issue. Overall, in case you are a serious player and want to get a top quality table, then this Butterfly Centrefold Sky Rollaway ping pong table will definitely suit all your needs. Other than the table is features with incredibly table top design, the fold and rollaway feature also is revolutionary. You will make a good investment if you buy this table that features with strong construction that you can use for many years. Thus, if you are looking for the best table and the price is not an issue for you, this is the one that surely worth for your consideration. To know more about other Butterfly table tennis tables, you can check out this post. There are still lot of different brands of outdoor tables being discussed here as well.